James Island, Just across the river from Charleston, has a long history of conflict. Early on the morning of April 12, 1861, Confed�erate troops in Fort Johnson, on the northern tip of the island opened fire on the Union forces in Fort Sumter, sparking the bloodiest war in Ameri�can history. But there is more to James Island than battles. It is home to McLeod Plantation, which was built in 1854 and still has intact slave cabins, as well as the Seashore Farmer�s Lodge Hall. Dedicated to preserving the heritage of the island, a 53-year-old tradition has been revived�the Island Heritage Festival , which showcases some of the island�s most historic sites. It also honors the Gullah traditions, which came about as African culture blended with that of early European settlers. James Island remained largely rural until the 1960s but has since grown to be a desirable residential area. It is a family-oriented com�munity, offering a wide variety of housing from comfortable older neighborhoods surrounded by Span�ish moss-draped oaks and mounds of azaleas to newer, more upscale devel�opments. Its proximity to Folly Beach and Charleston appeals to retirees and young families. The James Island connector has encouraged a strong surge in residential development since its completion. 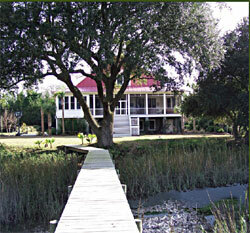 Many homes are sited along the tidal creeks and marshlands found throughout the island. Not only is the island located within minutes of downtown Charleston, it is also a short drive from beautiful and eclectic Folly Beach, also known as the �edge of America.� It is also famous for the Festival of Lights held each Christ�mas at the James Island County Park. People come from all over the Low�country to see the spectacular light displays and holiday village. Throughout the year, the James Island County Park offers residents walking trails, a water park, camp�grounds and other recreational activities.